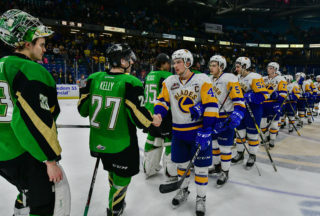 It was an exhilarating night at SaskTel Centre capping off what is probably the most thrilling week for the Saskatoon Blades in recent memory. Once again the Blades found themselves trailing heading into the 3rd period, this time 4-1 to Brandon Wheat Kings. 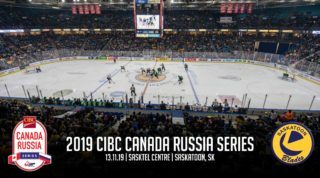 After coming back from a 6-2 deficit in Moose Jaw on Tuesday to lose in overtime, and then giving up a 4-1 lead in the 3rd period to Swift Current on Wednesday, the Blades did the unthinkable… again. 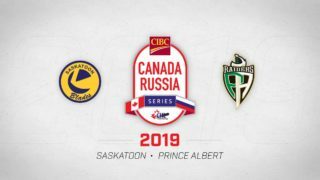 Five goals in the 3rd period including three in the final two minutes propelled the Blades to a 6-5 comeback victory over the Brandon Wheat Kings to improve to 9-12-2-1 on the season. Evan Weinger opened the scoring for Brandon just 28 seconds into the game kicking off what would be a big night for the 20-year-old Wheat King forward. Manitoba product, Brad Goethals answered back for the Blades just minutes later with his 5th of the season; Gage Ramsay helped out with the assist. The Wheat Kings would add one more to take a 2-1 lead into the 2nd period. The middle frame wasn’t kind to the Blades as Evan Weinger scored a short-handed to goal to put Brandon up 3-1 before Ty Lewis increased the lead to 4-1 on the man advantage. Brandon also held a slim lead on the shot clock 13-12. Finally in the third period the Blades were able to get their power play going. Cam Hebig ripped a wrist shot for his 20th goal of the season to cut the lead in half and make it a 4-2 game. Seconds after the goal, Kade Jensen was assessed a roughing minor sending the Blades back on the man advantage. Cam Hebig took the puck in from the point and gained all the attention from the Wheat Kings before slipping a pass to Braylon Shmyr in the slot who then went five-hole on Thompson to make it a one goal game at 4-3. The goals came 26 seconds apart giving Saskatoon full possession of momentum. Could the Blades do it again? Possibly, there was still over 14 minutes left on the clock. But later on Brandon was on the power play and Evan Weinger completed his hat-trick giving Brandon a two goal cushion once again. The Wheat Kings were in front 5-3 with 6:06 left in the game and with the way Logan Thompson was playing a comeback seemed out of reach. That wasn’t the case on the Blades bench, as they maintained their focus and kept pressing. With the net empty and an extra attacker on the ice, Libor Hájek skated in and beat Thompson with a wrist shot to get the Blades back within one. Brad Goethals and Chase Wouters added the assists. Still with the net empty and pressuring for an equalizer, Braylon Shmyr took the puck in wide and cut in towards the net. Logan Thompson made the initial save but Shmyr kept with it and swatted in his own rebound for his 2nd goal of the night to tie the game 5-5 with 1:07 left on the clock. After going to overtime in their previous two games earlier in the week, it was evident the Blades wanted to keep the pedal down and finish the job in regulation. Libor Hájek found the puck on his stick on the Brandon blue line, went across the ice to Rubinchik who then threw the puck on goal. Cam Hebig tipped the shot but Logan Thompson still made the save kicking the puck out to the opposite side circle where none other than #23 Braylon Shmyr was waiting… and yes, he pounced on the rolling puck with a backhand to light the lamp, complete the hat-trick, the comeback, and win the game for the Saskatoon Blades! Nolan Maier was all smiles back in the Blades crease as the buzzer sounded signalling the Blades victory and Maier’s first career win in the Western Hockey League. The rookie 16-year-old stopped 26/31 shots faced. Cameron Hebig had another big night for the Blades with a goal and 2 assists giving the Blades leading scorer 35 points on the season. Braylon Shmyr was the games first star (obviously) with a hat-trick and an assist to extend his point streak 6 games which includes 4 goals and 7 assists. 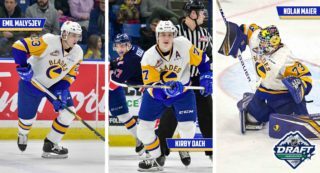 Chase Wouters (2A), Brad Goethals (1G,1A), and Mark Rubinchik (2A) also had multi-point nights while Kirby Dach added an assist to extend his point streak to four games (4A). Saskatoon outshot the Wheat Kings 43-31 while both teams managed to score twice on the power play. 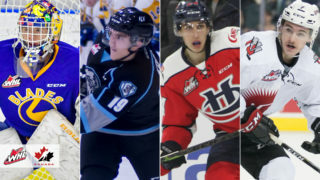 The Blades will now enjoy a rare Saturday off before loading the bus on Sunday night to head south of the border for a five game road trip though the U.S. Division which begins on Tuesday in Kennewick, Washington versus the Tri-City Americans. The next Blades home game is Saturday, December 9th at SaskTel Centre versus the Kamloops Blazers. Click here for tickets or call 306.975.8844 to book your group night or experience package!